Us men do love to build things. We’re also fond of taking them apart, reconfiguring them, even redesigning them and then putting them back together in our own unique way. That’s what Rich does with bikes. Rich’s love of bikes started from an early age. He remembers this old quarry at the back of his house that as a kid he used to ride all sorts of old knackered bikes in. Occasionally the bigger lads would give him a go on a proper crosser bike. We all have those fond memories of play time as a kid but we know the need for an education. Rich’s thoughts of a future after school swung towards a mechanical one and he trained as a maintenance engineer. He qualified after serving a four year apprenticeship and used those skills to work within the plant equipment industry and the food/drinks industry. Like lots of us, we spent our holidays in Cornwall and our connections here are never really lost. Rich’s family said they always would move here but they never did. However, Rich found himself spending more and more of his spare time down here so it seemed inevitable for him to make that move to the lovely land we all call home. Shortly after moving here, Rich learnt to sail, bought a 36' wooden cutter and started to restore it. A project that has been ongoing for many years. In his spare time, he started volunteering at a youth centre and eventually decided to retrain, go to university and ended up with a degree in youth and community. A few years later he got offered a role as a substance misuse practitioner, dealing with addiction and mental health problems with young people. A very challenging role I’m sure you’ll agree. Getting that sailing bug, being by the sea and retraining on the career front didn’t dismiss Rich’s love of bikes. “I've been taking bikes apart and rebuilding them for myself for years. I've built all sorts, Harleys, crazy pushbikes etc etc” Rich told me. 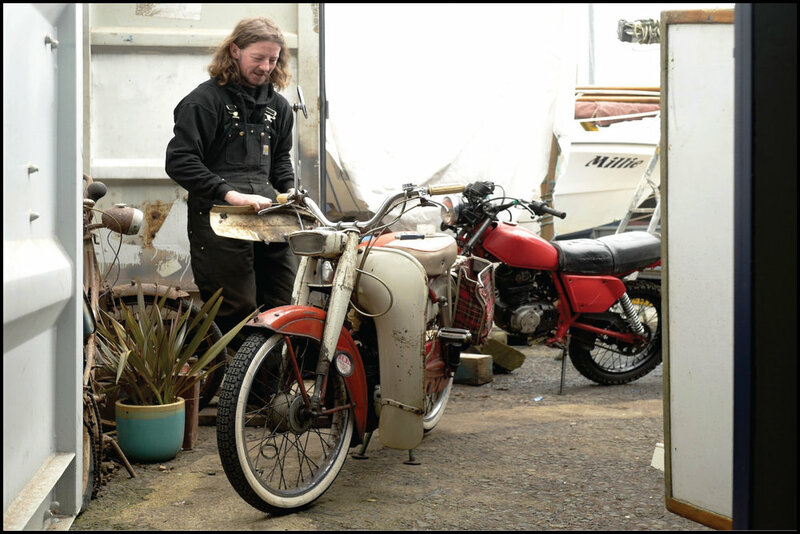 Armed with his knowledge and expertise, Rich set about putting a workshop together to build custom bikes for himself which lead to building bikes for customers too. A side line if you like. Rich told me “It would be great to call it a business and hopefully one day it might develop into something more”.